As many of you may know, the state meet for 2018 and beyond will be different. 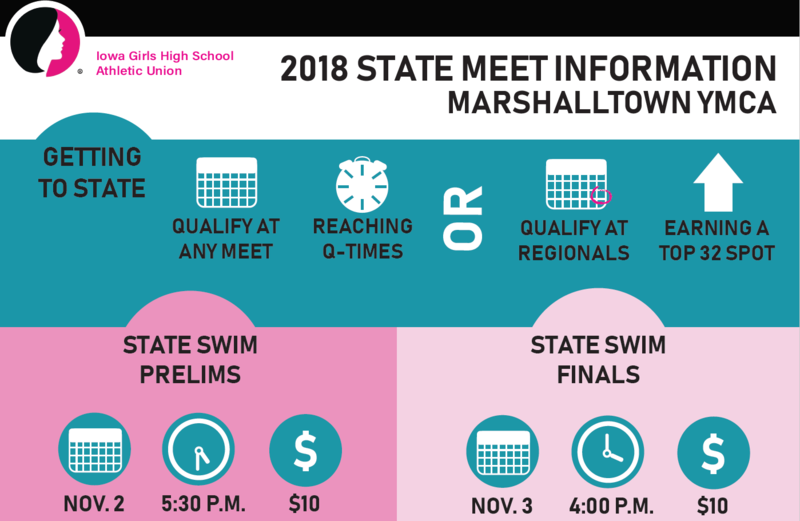 There are several changes to the meet, though the one of the biggest is that it has moved to a prelims/finals format for all individual swim events. In order to provide some quick information about these changes, we created this infographic with key changes highlighted. For more in-depth information, including the 2018 q-times, we encourage you to read more below. The regional meet will still play a key role in qualify for state, even having q-times. This is because athletes must be entered into their state event at the regional meet even if a q-time has been met. Additionally, athletes must also compete and legally finish in the event at regionals to qualify for State. If a swimmer is disqualified or does not finish the regional event, they will not be allowed to compete in that event at the State Meet, even if they had achieved the qualifying standard during the regular season. Prelims are seeded differently than before. The first heat will be seeds 25-32. The last three heats are circle-seeded. 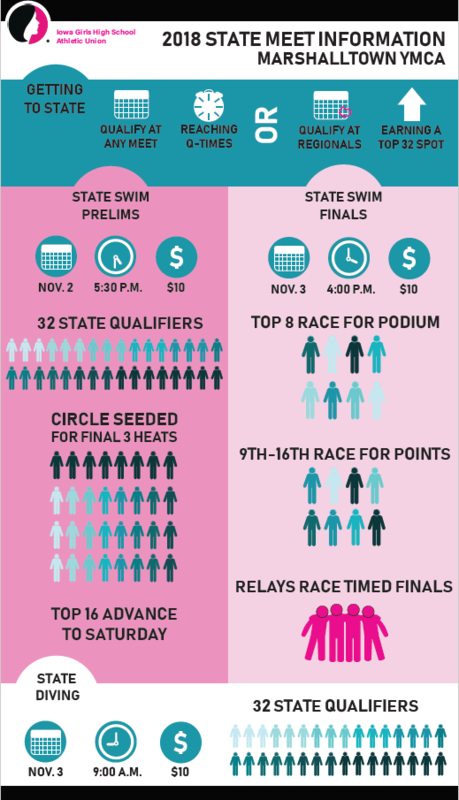 Here’s an example – the top three seeds in the state will swim in three separate heats. Number 1 will be in the fastest lane in last heat (heat 4). Number 2 will be in the fastest lane in the third heat. Number 3 will be in the fastest lane in the second heat. This will continue through all remaining 24 seeds. Notice the color gradation of the people icons on the graphic. They are colored in groups of three to illustrate this circle-seeding process. Finals will consist of two heats. The first heat is known as consolation finals because those seeded 9-16 are ineligible to finish higher than 9th place. Yes, that means theoretically someone could break the state record in this heat but not finish higher than 9th (aka no spot on the podium). This is incredibly unlikely to ever occur. Scoring for the state meet goes through 16 places, so swimmers in this heat are racing for points for their team. The last heat are true finals (we like to think of them as “podium finals”). These top eight swimmers are racing for spots on the podium in addition to points for their team. All relays swim timed finals like prior years. They are also seeded as before, with the slowest seeds in the last heat and the fastest seeds in the final heat.